Work hours is an excellent way for you to see the activities you logged during and outside your regular schedule. By default, they are set to Monday-Friday, 8am-6pm. But you can customize your work hours however you like. They will probably be most useful if you set them to be as close as possible to your regular schedule. How do I customize my work hours? It is an easy process that only takes a couple of steps. 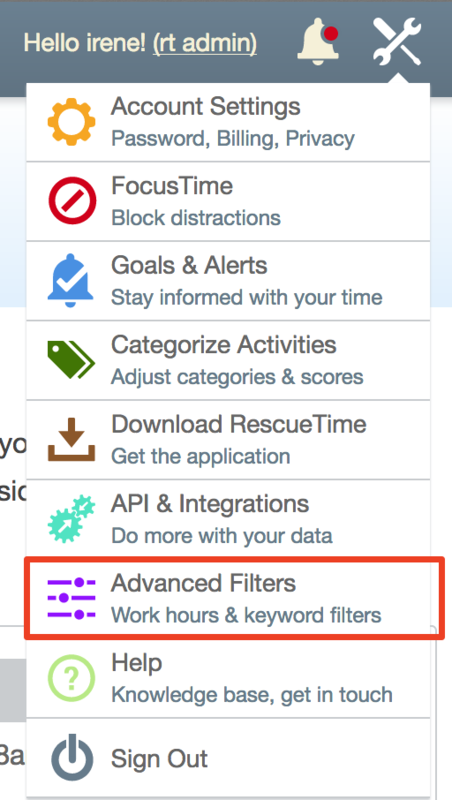 Click the Tools icons and select Advanced Filters from the menu. Under the Work Hours section click the Edit Your Work Hours button so you can start making those changes. Just select your starting and end time from the drop-down menu. How do I add a break or multiple shifts to my work hours? While you are adjusting the existing work hours to match your own keep a couple of things in mind. Within your working hours, you can add a break. For instance, you dedicate an hour of your day to activities that are not work related. Or you work multiple shifts within a given day. RescueTime will continue to log activities during the break you have set up, but they will not be reported as work hours. Instead, those activities will fall into the time logged outside work hours. On this image, the graph is showing that working hours are from 8am-6pm with an hour break at 3pm. The non-work hours are denoted under a gray block to make it easier to identify. Click the Edit Your Work Hours button and change the end time to 12 pm. This is the time when your first time period will end, and your break will start. To create a new time period click on the Advanced Options button. It'll automatically create a start date an hour after the end of the first time period. In this example, it'll be at 1 pm. This is the start of your second time period. Adjust the end time of your second time period. In this example, the end time of our work hours is 5 pm. Based on this setup, RescueTime will consider those activities between 8am-12pm and 1pm-5pm as work hours. The report for the day will look like this. The steps to set up shifts are very similar to break with just an extra step. As an example let's say your schedule is from 6am-10am and then you start back up from 4pm-8pm. Click the Edit Your Work Hours button and change your start time to 6 am and your end time to 10 am. At this point, you have set up your first shift. For your second shift, click on the Advanced Options button. It'll automatically create a start date an hour after the end of the first time period, but you can quickly adjust that time. Just select 4 pm from the drop-down menu. Adjust the end time of your second shift. In this case, the end time will be 8 pm.